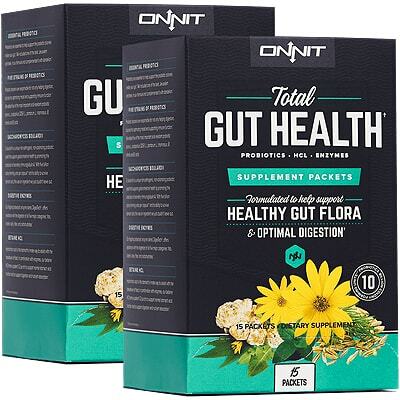 If you are in a hurry and just want to find the best keto probiotic then I’d recommend the Onnit Total Gut Health as the best for keto. Keto life is great, but if you are only eating bacon and cheese, you are ignoring the foods that feed your good gut bacteria. An imbalance in the gut microbiota is believed to contribute to a number of health problems, particularly gastrointestinal issues, as well as immune dysfunction and infections. Probiotics help tip the balance back in favor of the good bacteria. Do You Need Probiotics During Keto? The short answer, yes you do. Not just on a Keto diet, but basically everyone can benefit from taking a probiotic supplement and eating probiotic-rich foods. or an overgrowth of bacteria which can create all sorts of other issues like high fever, tonsillitis, etc. To prevent this, we need a certain balance of all of the microbes in our digestive system. Our bodies are made up of only 10% human cells, and 90% of what makes up our bodies, are microbes. These microbes live both within our body, and on the surface of our skin - which might sound kind of weird and scary at first, but they actually help us in many different ways. They help us digest the food we eat, and they help us eliminate the waste. They also protect our immune system, they help us with detoxification, they help provide nutrients for the body, they make B vitamins, and the list goes on. Without these microbes, we would have a LOT of health problems. A few of the most common symptoms that can occur if you don’t have the right balance of probiotics are constipation, gas, bloating, and bad breath. Getting probiotics while on Keto can be a difficult task due to companies marketing them mostly through stuff like gummy candies or sugary drinks and yogurts. You could potentially try to get them through things like Kefir and some aged types of cheeses, but considering that a lot of people are lactose-intolerant, it doesn’t seem like a very convenient way to do it. Fermented foods like sauerkraut, kimchi, and pickles are an excellent source of probiotics, but you need to eat a lot of them regularly to get the same benefits. Kombucha is also an excellent source of probiotics, but sadly almost all commercial brands have a lot of added sugar to make it taste better, so you would need to brew your own kombucha at home. On the other hand, incorporating a good quality probiotic supplement daily can make all of this way more convenient and save you from feeling overwhelmed. Being on Keto and having a busy lifestyle can be complicated enough, so its good to be able to have one less thing to worry about. Not all probiotics are the same; different strains of probiotics have very different effects on the body. Research so far has been very promising on these little friends of ours. Probiotics are especially beneficial for the overall health of the digestive system. They help improve many digestive issues like constipation, diarrhea, colitis, abdominal pain, irritable bowel syndrome, Chron’s disease, and flatulence. Beyond digestive health, probiotics have also been studied for their role in treating different allergies by improving the immune system function. Other than significantly reducing nasal symptoms as compared to the subjects taking a placebo, 8 weeks of probiotic supplementation during grass pollen season significantly lowered the concentrations of inflammatory markers that are typically elevated in seasonal hay fever. Yes, you heard it right, several studies strongly correlate a healthy gut with weight loss. Probiotics may help you lose weight through many different mechanisms. In a study where the subjects were mice, the research suggests that oral intake of Lactobacillus rhamnosus enhanced the survival rate of mice lethally infected with influenza virus. It was shown that orally administered L. rhamnosus activates humoral as well as cellular immune responses, leading to increased resistance to the host against influenza virus infection. (10) And even though the study was done on animals, the results are significant. As you can see from the previous section, not all probiotics are created equal. Specific strains of probiotics have been shown to have specific health benefits. And while we have listed several examples, there are way more studies on the subject - so, if you can’t find it here, we suggest that you do your own thorough research based on your needs. For certain conditions, you want to make sure that you are taking the strain that is most likely to benefit you. When choosing a probiotic supplement, you want to make sure that the “CFU’s” (colony forming units) amount is in the billions. Anything less than that is not as potent. You can find probiotics ranging from 1 to 100 billion CFU’s per serving. We believe that a probiotic that has about 10-30 billion CFU’s per serving is a good amount to aim for. Also, the label should specify that the living microbes are shelf-stable and they will keep their potency through the end of the expiration date. Obviously, brand quality is important when it comes to purchasing anything of value. Unfortunately, many commercial grade brands don’t measure up when it comes to quality. If you happen to choose such a supplement, it is very likely that the probiotics in the bottle are already dead and they will just waste your time, health, and money. To avoid such issues, we strongly suggest buying a professional brand from a reputable health care professional or a bigger company that stands by their product. The products that are tested and approved by the FDA (US Food and Drug Administration) or similar quality control companies are usually your best bet. While you can often sacrifice quality for value with other products, we don’t recommend you do that when it comes to a probiotic supplement. Quality beats everything – supplements with a price that seems too good to be true are probably not of good quality. Depending on the strains used and overall quality of the product, a good probiotic supplement can cost anywhere from 20-70$. ​The Onnit Total Gut Health is kind of an all-in-one gut health product. It features packets, each containing a mix of 7 capsules providing total care for your gut and digestive system. While most others are individual probiotic, prebiotic or digestive enzyme supplements, the Onnit packets are specifically made to cover every aspect of improving one’s gut health. Which is pretty convenient, since if you want all of the supplements individually, you’d have to buy a few different bottles. Onnit Labs is founded by Aubrey Marcus, a man who was so invested in his own personal development that he created Onnit so that he could work on “Total Human Optimization.” He wanted to become the best version of himself and help others achieve the same. Since 2010, Onnit Labs has grown dramatically, and they now have over 250 unique products on the market. They make and sell health supplements, nootropics, snack bars, oils, drinks, and fitness equipment. The probiotic capsules are made of 5 different strains (Lactobacillus and Bifidobacterium), and all of them are specifically selected because of their natural acid-resistant ability to survive the stomach bile. The prebiotic fiber capsules serve as food for the probiotics, and the Betaine HCL makes sure that the stomach’s acid level is optimized. Additionally, the digestive enzymes help you break down the food you eat faster and easier. 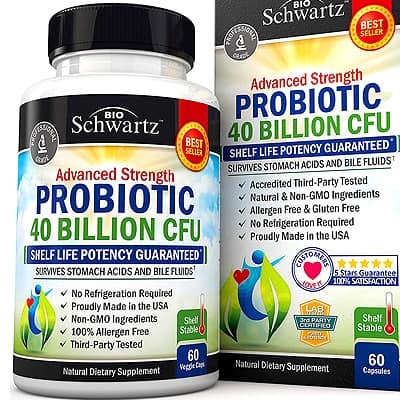 ​Schwartz Bioresearch Probiotic 40 Billion CFU’s is a blend of 4 scientifically studied Bifidobacterium and Lactobacillus strains and 40 billion colony forming units. The product is Vegetarian and made only of natural ingredients, and Schwartz Bioresearch guarantees its potency until the expiration date. ​Schwartz Bioresearch is the brand behind the BIO Schwartz Probiotic. They are a well-known US-based company founded in 2014, and they pride themselves with manufacturing only FDA-approved allergen and gluten-free products with no fillers, binders or GMO ingredients. The product comes as a bottle containing 60 Veggie Capsules. There is 40 Billion CFU’s of probiotic per 2 capsules, so by using the standard serving size, the bottle would last you one full month. All of the 4 strains of probiotic used are of high quality. They can survive stomach bile and make it to the intestinal tract completely unaffected. As additional protection, the capsules use a patented MAKTrek stomach acid protection and delivery system. It has been scientifically studied, and it makes sure that none of the probiotic’s potency is wasted. Also, the 40 billion CFU’s per serving size is actually a very good amount. Most other brands have way lower probiotic potency. ​The Nutrition Essentials Digestive Health probiotic features 15 billion CFU’s of only one strain, Lactobacillus Acidophilus. It is in the form of tablets, and other than the probiotic it also has a small amount of prebiotic fiber. It’s a GMP certified product, which stands for Good Manufacturing Practice. It’s a system promulgated by the US Food and Drug Administration for ensuring products are consistently produced and controlled according to quality standards. ​The product is manufactured by Nutrition Essentials, a US-based health supplement company founded in 2013. Including the probiotic they make and sell only 4 supplements in total, but still, they are a well-known and respectable brand in the industry. 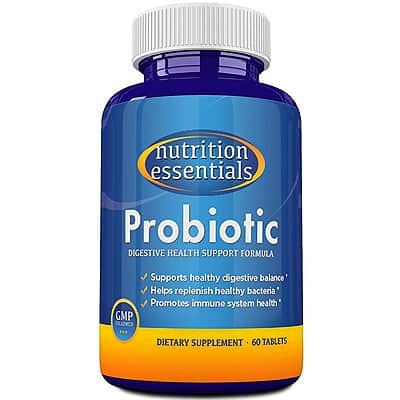 The probiotic comes in a bottle containing 60 tablets. Each tablet has 15 billion CFU’s of Lactobacillus acidophilus and 500mg prebiotic fiber. And even though Acidophilus is good quality and well-researched probiotic strain, it’s still kind of a downside that it’s the only strain the product has. Other than the probiotic, the tablets also contain 500mg of Nutri-Fructo BB-88, which is a Fructooligosaccharide (short-chain fiber from plant sugar), often used as a natural sweetener. It is also used as a prebiotic since it actually feeds the good gut bacteria, and don’t worry, even though it’s made from plant sugar, it’s a fiber, and it doesn’t affect blood sugar and insulin.